Ben Sale of the excellent Herts Moths Blog is always a very welcome visitor in Comments here and his last, on my most recent post, was an example. He took a look at the rather sad, dead and unidentified moth which I featured on 4th November - and repeat above - and wondered if it might be something a little rare. To whit, the Sombre Brocade, a moth from southern France and the Iberian peninsular which isn't even mentioned in my first edition (2003) of the Moth Bible. It does, however, make an appearance in the current, third edition (2017) after making landfall in Guernesey in 2006 and arriving on the UK mainland in Dorset two years later. 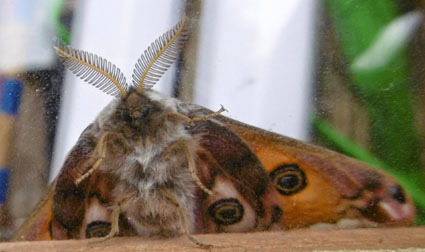 Since then, it has been recorded in Cornwall, Devon, Kent and London and is clearly one of an encouraging number of immigrant moths which are making visits, and perhaps a home, amongst us. And will not be discouraged by Brexit. But is this one? When I put the photos above on the unfailing helpful Upper Thames Moths blog, the experts Marc Botham and Dave Wilton reckoned that it was a Brindled Green, which struck me as right. At that stage, I had still not heard of the Sombre Brocade and so I was interested, when Ben introduced me to it and I went a-Googling, to find how similar the two moths are. If you look at this interesting post from the Portland Bird Observatory in Dorset towards the end of September, you will see what I mean. And here, above, is their helpful picture of two 'standard' pictures of the Brindled Green and Sombre Brocade, together with a moth which was causing them a certain amount of ID headache, and which turned out to be an SB. So I have copied their style and append two photos incorporating the forewings of my moth alongside the standards kindly provided by Portland, so that you can ponder and - if so inclined - pass your verdict on to me. However academic the exercise, because the moth is gone and its state and my photos almost certainly unacceptable for definite records, it will at least give you some sympathy for detectives, spies and others who have to puzzle for hours over grainy snapshots of CCTV images. That's my hand in the background; how beautiful. My own opinion still tends towards the Brindled Green, but don't let that influence you either way (seeing how I am almost aways wrong). Good luck! Update: the experts on UTM all reckon that it is, or was, a Brindled Green, but also a useful reminder of the two moths' similarities. We will all have to keep a careful eye in September 2019.